Pro - This feature is only available to Pro subscribers. To upgrade to a Pro subscription, please click here. Start by navigating to the Reports tab in your sidebar. Give your report a title so you can easily locate it again. You might call a report “Monthly invoice” if you want to run the same report every month to find the service providers who have completed jobs in that timeframe. This is an important step. Without it, you will see all results from when you started using Properly until the present day. We recommend using a date range in all of your reports unless you are specifically running a report for all instances of a given set of data. You can select this week, this month, last week, last month, or a custom date range of your choosing. You will see the date range you select highlighted in orange, so you can be sure your report covers the correct days. You can choose whether to view properties with a job Pending, Accepted, Declined, or Canceled. You can also select all statuses to view properties with any job type. Narrow your range to only a few properties, or select All Properties to include all properties. Narrow your range to only a few service providers, or select All Service Providers to include all service providers. Use the column selector to narrow which columns will appear in your report. You can include columns that show the Property Title, number of bedrooms, the service provider who serviced the property, the city the properties are located in, and much more. If you do not save your report, you will need to create it again. When you save a report, it will appear in a list on the left-hand side. If you want to run a saved report, simply select it and it will automatically populate on the right-hand side. If you want to share a report, click Export in the upper right-hand corner. 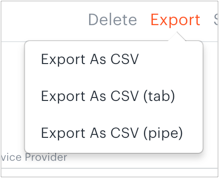 You can then choose to Export as .csv, Export as .csv (tab) or csv. (pipe) file. Note: If you are using Safari and do not see the Save File window, read the orange text on the small message and check the name of your downloaded file.